As time goes, my mercurial ‘activity’ plugin has got more and more options. Useful and requested options of course, but still it kinda clobber the –help output and it is more and more cumbersome to play with. This is why I have introduced a new frontend, based on Qt, to play/decide about those options. First, let me issue a very strong statement: this is optional and it is still possible to use the extension in an desktop-less environment (aka a server). This is an important point as many people, including myself, use the extension to provide activity information on some html page, maybe even integrating with the mercurial web interface. file: this is the previous behaviour, and is the default value. A image file is created and it exits. 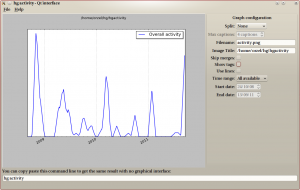 display: this opens a window with the activity graph, using matplotlib, you can not change anything. 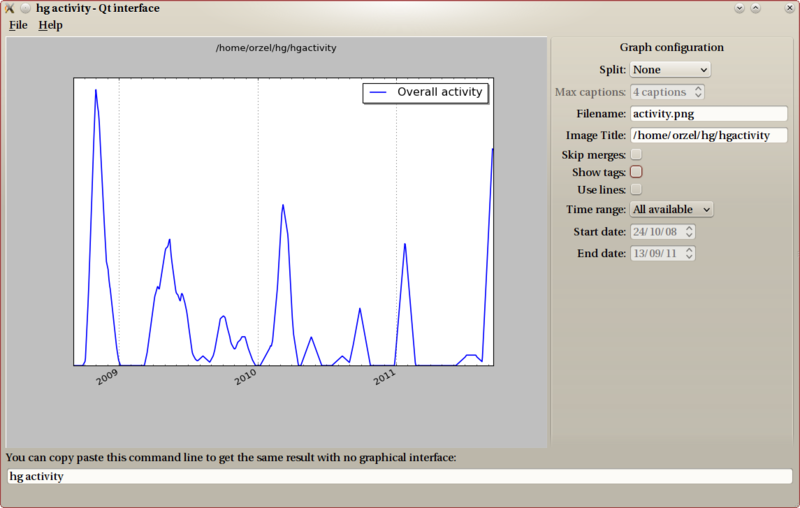 gui: this opens a full-fledge window, where you can change options and see ‘in real time’ how the graph changes. You’ll notice that the bottom of the window contains the corresponding command line, that you can copy/paste.